Our Abpromise guarantee covers the use of ab48824 in the following tested applications. WB Use a concentration of 0.625 µg/ml. 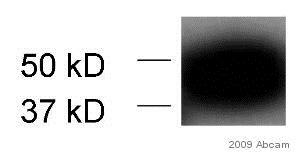 Detects a band of approximately 43 kDa (predicted molecular weight: 43 kDa). Good results were obtained when blocked with 5% non-fat dry milk in 0.05% PBS-T. Plays an important role in caveolae formation and organization. Required for the sequestration of mobile caveolin into immobile caveolae. Termination of transcription by RNA polymerase I involves pausing of transcription by TTF1, and the dissociation of the transcription complex, releasing pre-rRNA and RNA polymerase I from the template. PTRF is required for dissociation of the ternary transcription complex. Belongs to the PTRF/SDPR family. 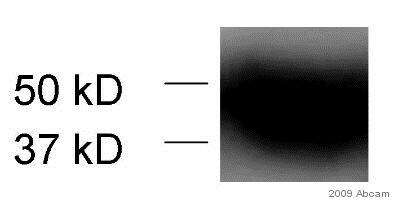 Phosphorylated. Present in active and inactive forms. Changes in phosphorylation pattern may alter activity. Five truncated forms are found in the caveolae. These are thought to be the result of proteolysis and may be phosphorylation-dependent. Membrane > caveola. Cell membrane. Microsome. Endoplasmic reticulum. Cytoplasm > cytosol. Mitochondrion. Nucleus. Found at the surface of the caveolae. Also found in the plasma membrane, microsomal and cytosolic fractions and at a low level in the mitochondrial and nuclear fractions. Translocates to the cytoplasm from the caveolae upon insulin stimulation. CAV1 is necessary to recruit it to the cell membrane (By similarity). Co-localizes with CAV1 in lipid rafts in adipocytes. Incubated with the primary antibody for 1 hour at 22°C. 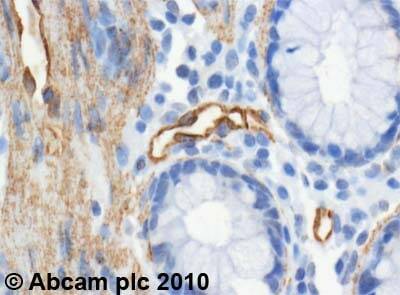 ab48824 (4µg/ml) staining PTRF in human colon using an automated system (DAKO Autostainer Plus). 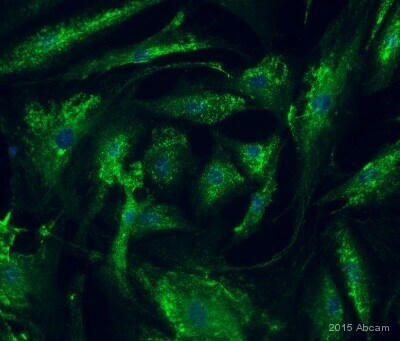 Using this protocol there is strong nuclear and cytoplasmic staining. 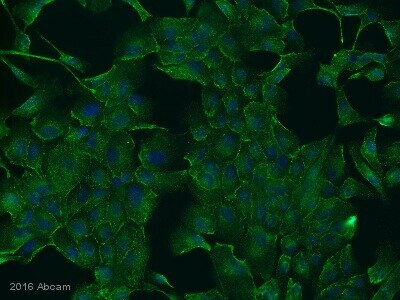 Immunocytochemistry/ Immunofluorescence - Anti-PTRF antibody (ab48824)This image is courtesy of an anonymous Abreview. Immunocytochemical analysis of MDCK (Madin-Darby Canine Kidney) epithelial cells, labeling PTRF with ab48824. 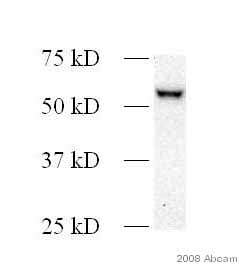 Cells were paraformaldehyde fixed, permeabilized in 0.1% Trition in PBS and blocked in 10% serum for 30 mintues at 22°C. Incubation with anti-PTRF diluted 1/300 was for 1 hour at 22°C. 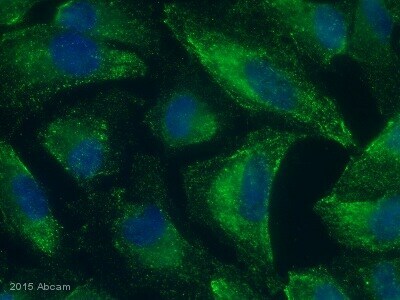 Nuclei have been stained blue. Immunocytochemical analysis of HeLa cells, labeling PTRF with ab48824. Cells were paraformaldehyde fixed, permeabilized in 0.1% Trition in PBS and blocked in 10% serum for 30 mintues at 22°C. Incubation with anti-PTRF diluted 1/300 was for 1 hour at 22°C. 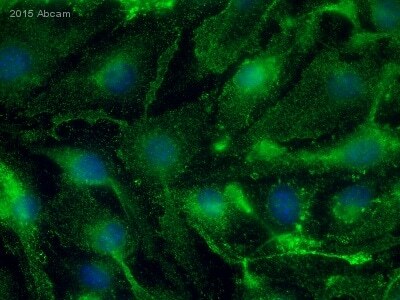 Nuclei have been stained blue. Immunocytochemical analysis of human AT2 cells, labeling PTRF with ab48824. Cells were paraformaldehyde fixed, blocked in 3% BSA and 0.1% saponin in PBS, then incubated with ab48824. 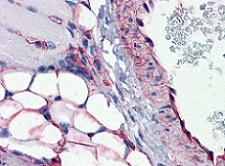 Immunohistochemical analysis of FFPE mouse vessel and adipocytes (skeletal muscle) tissue, labeling PTRF with ab48824 (5µg/ml). Publishing research using ab48824? Please let us know so that we can cite the reference in this datasheet.